From the cocoa fields in western African to the tomato plantations of Florida, workers are coerced to work for little to no wages in extremely poor conditions. Some are trafficked through debt peonage, forced from their homes to labor on farms as a way of supposedly negating their debt. Others are captured and taken across borders to work in what many consider slavery-like conditions. 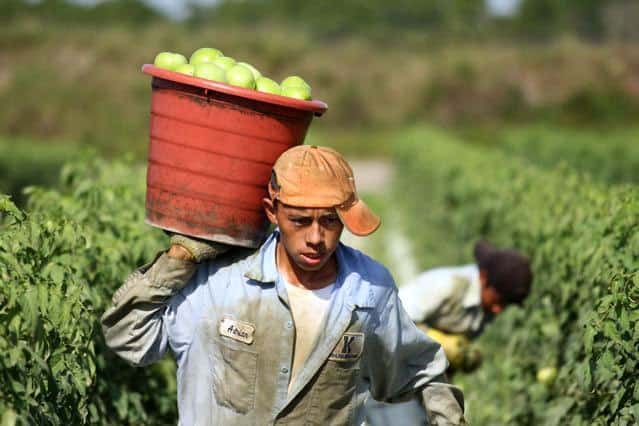 This photograph, showing a young Hispanic man working fervently in a tomato field, complicates our typical understanding of slavery. Though movies like Taken and images like “Who is a Slave?” in this collection show young white women as the victims of contemporary trafficking, there are huge numbers of Hispanic workers being forced to work for little or nothing in America’s farmlands. This occurs on a global scale as well, as men, women, and children are captured or coerced into picking cotton, fruit, cocoa, and other products.